Located in the heart of the Poconos, the Frogtown Chophouse offers something for everyone. From steak to seafood, come enjoy casual fine dining. Whether you’re looking for a night of fine dining or a casual meal to enjoy, the Frogtown Chophouse is an ideal destination. The classic American chophouse menu features culinary delights including steaks, seafood and artisan cocktails. The space dates back to the early 1800s, but the Frogtown Chophouse experience is anything but old-fashioned. Live music is featured every Friday through Sunday. Outdoor dining is available. Reservations are recommended. Date of Availability: The Frogtown Chophouse is open for dinner at 5pm daily. Happy hour starts at 4pm Wednesday-Friday. Brunch is served at 11am every Sunday. 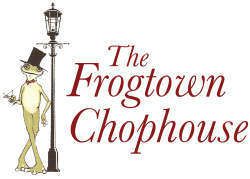 Hours: The Frogtown Chophouse is open for dinner at 5pm daily. Happy hour starts at 4pm Wednesday-Friday. Brunch is served at 11am every Sunday. Visit The Frogtown Chophouse during Pocono Mountains Restaurant Month, "Taste of the Poconos" - April 22, 2019 to May 19, 2019!